This session focuses on the relationship between the individual history of an object and how it is perceived. Papers should clearly show the indivisible interdependence of the object and its history of ownership. We would like to focus on three related questions: What effect does the provenance of an object have on its material as well as non-material value? How do the history of ownership, exhibition and discourse of an object influence its reception on the art market, by private and public collectors as well as its coverage in the media? And how is this modified perception of objects reflected by their exhibition in museums? An exact analysis of the object is the starting point for any research into provenance. This includes the clarification of fundamental data such as material, attribution, authenticity and exact dating as well as questions pertaining to the time when the work received its title, the authenticity of its frame as well as the search for clues about its biography in and on the object itself. For this reason, it is especially important for us to specifically look for any material traces of the chain of ownership that may be present on the object itself. First and foremost, an object should be examined as a palimpsest that bears traces of its previous owners. However, just as important is considering the use of presentation tools such as frames, pedestals, display cases, etc., the methods used in the object’s restoration and other modifications to or inscriptions on the object that were intended to directly influence how it was perceived. Does this mean that it is necessary for scholarship to return its focus in art historical research to the object itself? To what extent can the cultural self-concept of the original or owning society be inscribed into a single object? During the session, research into provenance should be understood as not limited to a certain epoch, thus not exclusively from the context of Nazi plundering (Nazi art theft). 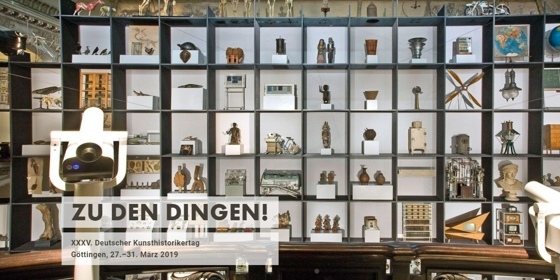 Likewise, we would like to encourage the submission of papers that do not or do not just focus on works of the fine arts, but also craftwork and objects related to technological or natural history and ethnological objects. Lectures on individual objects as well as on individual institutions and broader historical interrelationships and methodological issues are also welcome. The congress is a biennial meeting of a German specialist society and an event of national significance with international participation; therefore, the Deutsche Forschungsgemeinschaft (DFG) usually provides funding for speakers from foreign countries. Funding is provided for travel expenses (rail or air) for roundtrip travel to the meeting as well as maintenance costs for each day of the event. Closing date for submissions: 25 May 2018. Applications may only be submitted to the association office using the online application portal on the congress website.